Robert J. Farbman, D.D.S., P.A. 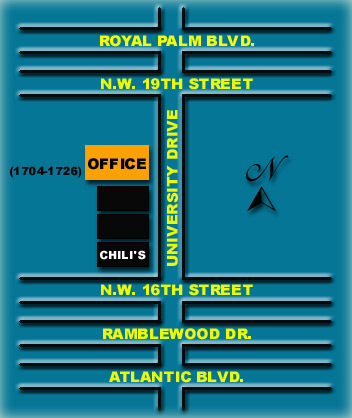 Our offices are located on University Drive, between Royal Palm Boulevard and Atlantic Boulevard. We are on the west side of University Drive, 100 yards north of Chili's Restaurant. Click here to retrieve driving directions from Google Maps.